Welcome to our Michigan Catering portfolio. We have worked with many in the restaurant and catering fields. Upper Michigan Catering - BBQ! 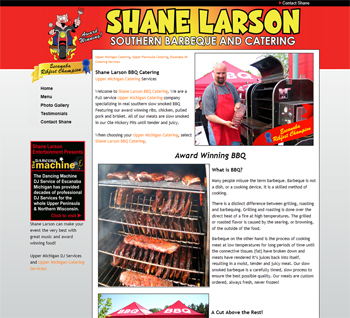 Welcome to Shane Larson BBQ Catering. We are a Full service Upper Michigan Catering company specializing in real southern slow smoked BBQ Featuring our award winning ribs, chicken, pulled pork and brisket. All of our meats are slow smoked in our Ole Hickory Pits until tender and juicy.